Subduction zones are a key ingredient of the Plate Tectonics restless ballet constantly reshaping our planet: these are the sites where oceanic tectonic plates start their descent and disappear into the Earth’s mantle. As such, they exert a fundamental control on our changing environment, including Climate, and appear to be (geo)dynamic environments unique to planet Earth. Subduction zones/trenches straddle the planet across ~43000 km and represent the major site of convergence and encounter of lithospheric plates, triggering devastating earthquakes as a result of friction (across the ~40 first km) and disastrous volcanic eruptions due to melting processes deeper down, as plates heat up (at ~80-120 km depths). Subduction not only drives Plate Tectonics but plays a fundamental role in our daily life: half of the world’s population lives on top or nearby a subduction zone in coastal areas repeatedly devastated by large earthquakes, tsunamis or volcanic eruptions. Gigantic earthquakes occurring on subduction zone mega-thrusts (with Mw magnitudes > 8.9, the largest recorded on Earth) are indeed the deadliest natural hazards, claiming many lives during the last decade (Sumatra, Chile, Japan) and causing considerable economic loss (over 200 billion Euros for the 2011 Japan earthquake according to the Word Bank). Fig. 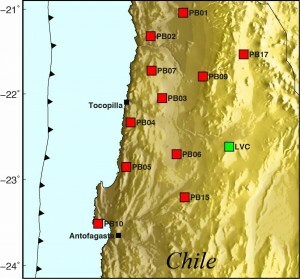 1 — ZIP efforts to bridge spatial/temporal scales (and gaps) to improve our still poor understanding of subduction interfaces: welding geophysical data on present-day subductions (a: composite section across the Andes; CINCA, ANCORP projects) with numerical models (b) and fossil evidence from the rock record (c-d). 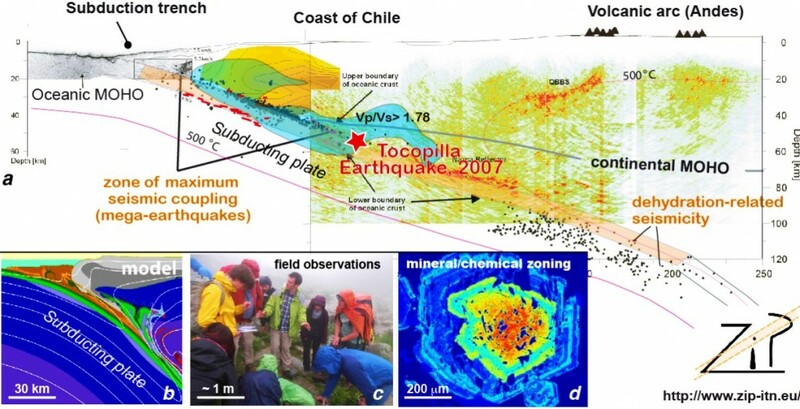 These phenomena are fundamentally controlled by processes at and across the subduction zone inter-plate boundaries at depths inaccessible to direct observation. There, complex, mechanically and lithologically diverse materials release stress and energy through earthquakes, creep and long-term deformation; material and energy are transferred via fluids and silicate melts along time and length scales ranging from seconds to millions of years, from nanometers to hundreds of kilometers. 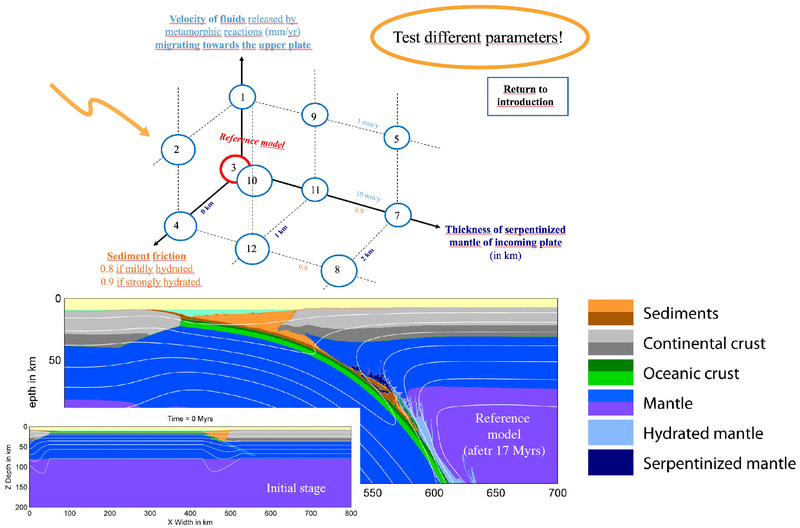 The nature, structure and properties of subduction plate interfaces are, unfortunately, still largely unknown: these is a crucial need for a thorough “Zoom in between the Plates” ZIP, for both better hazard assessment and understanding of how stresses, energy release and fluid-mediated mass transfer take place and interact on such varied spatial and temporal scales. This entry was posted on 24 May 2013 by admin.